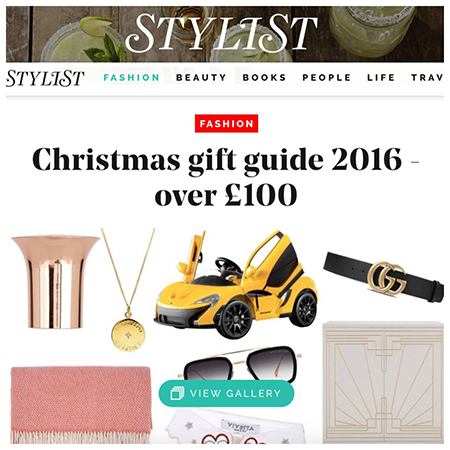 Super chuffed to have a feature in Stylist Christmas Gift Guide 2016. Our Diamond Latitude & Longitude Necklace has definitely become a hot favourite from our new collection of pretty pretty jewels. Inspired by the time of ancient Greeks when explorers travelled by starlight – the lost art of celestial navigation – where the sun and eclipses of Jupiter’s moons revealed the secrets of their exact location. Just like a star from the skies, the Diamond Latitude and Longitude Necklace is embellished with a brilliant cut sparkly diamond in a Victoriana star style setting and is hand engraved with coordinates of your chosen destination. Make your special place even more meaningful knowing that the latitude and longitude coordinates have been determined by the celestial heavens above. This personalised necklace is a unique way of commemorating a memory shared with your loved one. A gift she will be head over heels with this Christmas. Need some inspiration on what coordinates to choose to be hand engraved? Perhaps they could mark the first place you met, a place you shared lots of laughter, a holiday or simply your home, somewhere that is close to the heart, so she can carry the memento of this secret location with her always. Show them that even if you’re apart you’ll always be with them. The diamond adds an extra special touch, and is known to be the symbol of eternal love. We can also take the personalisation of this necklace up a notch, why not get a birthstone embellished, a precious gemstone personal to the one you love. Please do read our other blog posts with the meaning and symbolism behind each month’s birthstone. Make her feel loved like nothing else this Christmas.